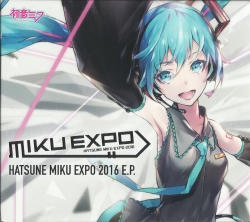 Sold exclusively at MIKU EXPO 2016 concert venues, KINOKUNIYA BOOK STORE & MIKU EXPO Let's Draw! Event. Also given to those who pledged 28 USD in the MIKU EXPO PledgeMusic campaign. (People who pledged 48 USD recieved the EP signed by Hachioji P). Features the winner, runner-up and honorable mentions of the HATSUNE MIKU EXPO SONG CONTEST hosted by Crypton Future Media in celebration of MIKU EXPO. All songs performed by Miku Hatsune. Music by Ary Warnaar and Peter Berkman. Lyrics by Peter Berkman, Ary Warnaar, Josh Knapp, David M and Stella M.
MIKU EXPO 2016 EP Tracklist, + Remixers Announcement! !